NOTICE IS HEREBY GIVEN that Hampshire County Council proposes to make an order to allow South East Water to execute a new mains connection. ROAD TO BE CLOSED: That part of Oakhanger Road between its junction with Hartley Lane and its junction with Oakhanger Road / Latchford Lane. 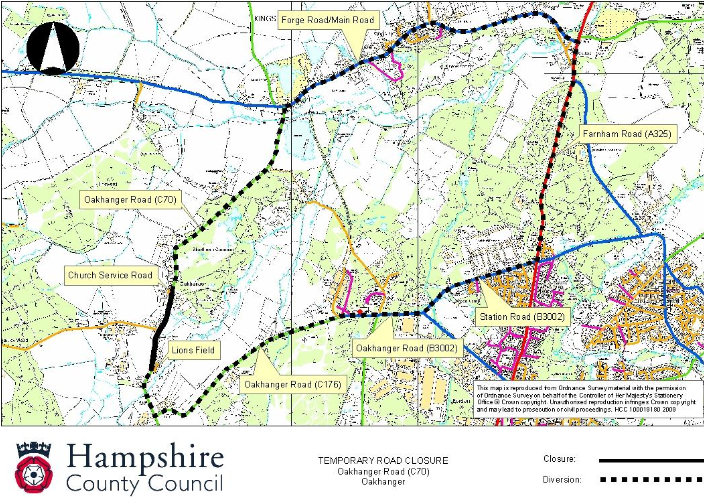 ALTERNATIVE ROUTE: (from north to south and vice-versa) Oakhanger Road (C70), Main Road / Forge Road, Farnham Road, Station Road, Oakhanger Road (B3002 and C176).